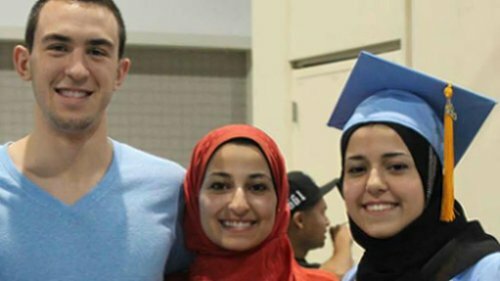 The heinous, senseless murders of Deah Shaddy Barakat, 23, of Syrian descent; his spouse, Yusor Mohammad Abu-Salha, 21; and her sister, Razan Mohammad Abu-Salha, 19, of Palestinian descent and all Muslim, near the campus of the University of North Carolina-Chapel Hill on Feb. 10, has evoked shock, sadness and outrage worldwide. Protests and vigils have been held in the U.S. and throughout the world, including Occupied Gaza, to expose the root cause — Islamophobia — of the execution-style murders of these young people. The local police attempted to downplay the motives of the admitted murderer, Craig Hicks, a white neighbor, as a parking dispute. But the family of the two sisters and others dispelled that notion by pointing out that on more than one occasion, Hicks targeted them specifically by coming to their apartment and brandishing a gun in his belt. The families are demanding a federal investigation of the murders as a hate crime against Muslims. These murders have also helped to expose the callousness and indifference of the big-business media. Following the murders, there were no breaking news announcements in the electronic press, online or on TV. These murders were treated like any news story. Compare that to the Paris killings at the Charlie Hebdo office on Jan. 7 in response to the magazine’s satirical Islamophobic cartoons. Unlike the North Carolina incident, non-stop for hours upon hours, days upon days, all news was relegated to the back burner except for Paris. The mainstream media, the mouthpiece for the ruling class and Western governments, had a virtual field day using the killings as a political pretext for spewing anti-Muslim rhetoric and racism. This propaganda is itself an act of terrorism at home and abroad. In response to this blatant slap in the face by the powers that be, the people made Twitter the social media center for sharing criticism against the local police, the government and the media for downplaying the North Carolina murders. #ChapelHillshootings and #MuslimLivesMatter became two of the top trends worldwide. That’s what every interested person was following. When we consider these recent murders and the violence and bigotry against Muslim people in general, especially since the 9/11 attacks in 2001, the main question we should ask is not why the Feb. 10 tragedy happened, but when it would happen again and under what circumstances — if we don’t mobilize to stop it. The North Carolina killings cannot be separated from the murders of Trayvon Martin, Michael Brown, Eric Garner, Tamir Rice, John Crawford III, Jessie Hernandez and even the most recently videotaped murder of Antonio Zambrano-Montes. These well-known cases and countless others are linked to growing racist state repression, legal and extra-legal. The untimely deaths of these victims will help forge a broader multinational, working-class fightback against the entire rotten capitalist system, which was initiated by the Black Lives Matter movement. 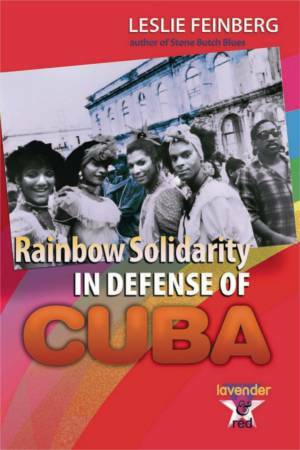 Already there have been mobilizations protesting the North Carolina killings in which Workers World correspondents participated. 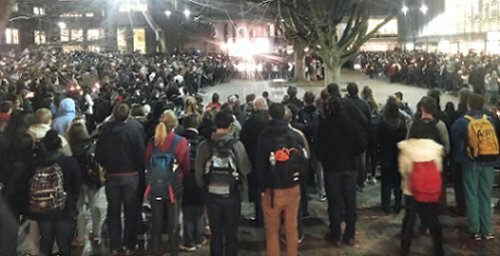 Thousands turned out Feb. 11 at a vigil at UNC in Chapel Hill, N.C., in remembrance of the three young Muslims murdered near the school. Another vigil was held the evening of Feb. 12 at North Carolina State University in Raleigh, where Razan Mohammad Abu-Salha was a student. Some 100 students and community members came out for a vigil on Feb. 12 in Philadelphia despite frigid weather. They gathered at the base of Temple University’s Bell Tower in solidarity with the three Muslim students murdered in Chapel Hill. Andy Katz, Joe Piette and John Catalinotto contributed reports.